Imagine that you’ve written an app and it’s successful beyond your dreams. How are you going to handle that wonderful torrent of traffic? Fear not! We’ve published a new online training course at Udacity that will teach you all you need to know to build robust scalable applications in Python. Developing Scalable Apps for Python is the follow-up course to the Java version that we released last summer. Ever since then, people have been clamoring for a Python version of the course. You asked, and we listened. Created by Magnus Hyttsten, Jocelyn Becker, and Karl Krueger, the course discusses the core concepts of building scalable apps using Google App Engine. You’ll put this knowledge into practice by coding, step by step, an application for easily creating and registering for conferences. Your app will be accessible to both mobile and web clients. Understand how technologies such as Task Queues, Memcache, Edge Caching, and Datastore can be combined to develop an app that scales. Sound interesting? 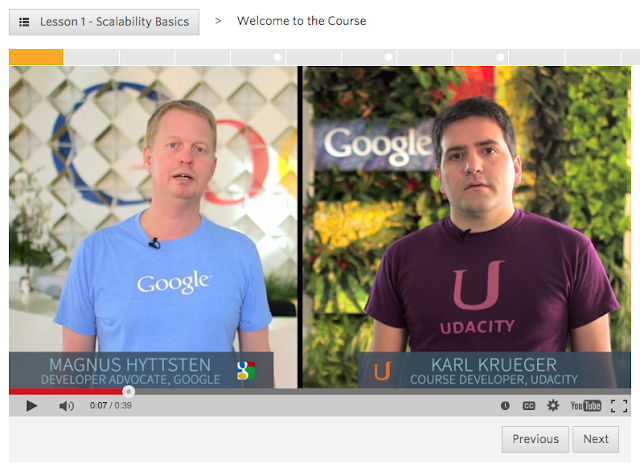 Then sign up for the Python or Java version of the Udacity course. Also, join the conversation at @GoogleCloud on Twitter.